Perfluorinated compounds are carcinogenic, including pefluorooctanoic acid (PFOA, or C8) used in Teflon processing. Beware of newer “non-stick” surfaces. Coated titanium and “nanotechnology” coatings have been found to incorporate perfluorinated compounds. The satin black enamel interior surface on this kind of Le Creuset skillet is made from the same ceramic material used on their dutch ovens, soup pots, etc. It starts out a bit rough and requires “seasoning” with oil just as you would with cast iron cookware. However, unlike bare cast iron, there are no metals or impurities available to leach into food. 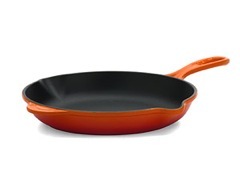 Be patient, it takes time for the non-stick qualities of this Le Creuset cookware to develop. Repeated use with a quality cooking oil (such as coconut oil or grapeseed oil) allows the surface to even out and provide excellent non-stick performance. Found on skillets and griddles. 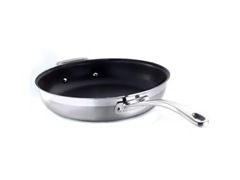 The black surface on this kind of Le Creuset skillet is made with perfluorinated compounds. Found on omlette pans, crepe pans, and some other specialty items.